eTech has been recognised in the prestigious Top 100 Apprenticeship Employer list, sponsored by City & Guilds, which is compiled annually by the National Apprenticeship Service and recognises excellence in businesses that employ apprentices. The list was announced at the National Apprenticeship Awards, which took place on 26th January at the Grosvenor House, A JW Marriott Hotel, London. 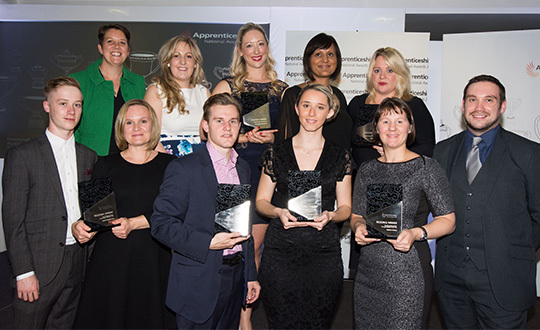 After a tough selection process the most exceptional apprenticeship employers from all National Apprenticeship Awards employer categories went forward to feature in the list which showcases the breadth of employers who now offer apprenticeships. eTech runs an extensive talent programme that recruits a lot of young people in the midlands. Whether you are on our graduate programme or coming to us as an Apprentice, by joining eTech you will get to experience different areas of an expanding, market-leading organisation. Ultimately it is our work philosophy that makes the difference, and we would not have been able to get this award if each colleague did not work with conviction and enthusiasm at full capacity.